And it made me sad when I heard that one of our bridges, albeit a small and specialized one, was closing because of the government shutdown. The Ballard Locks (properly the Hiram M. Chittenden Locks, but who wants to say that?) has closed for the foreseeable future (h/t to @jeffcarlson and @myballard). The locks are a combination transportation system, locks, tourist attraction, fish ladder and pedestrian bridge between two Seattle neighborhoods. The locks and dam span the Ballard Ship Canal in Seattle, allowing travel back and forth by water between the Puget Sound and Lakes Union and Washington. The locks serve as a footpath connection between the Magnolia and Ballard neighborhoods, and also provide a scenic bike route home for me from my workplace in South Lake Union. Let me describe the locks as I know them. During late Spring, Summer and early Fall, before axial tilt and daylight savings combine to bring darkness to my bike commute, I often take the long way home from South Lake Union. I bike down to Myrtle Edwards Park and through Interbay to the Ballard Locks. There I dismount and walk my bike downhill. The Locks straddle the Ship Canal, flanked by green, grassy slopes on either side and the Salmon Bay Train Bridge spanning the Canal to the South. 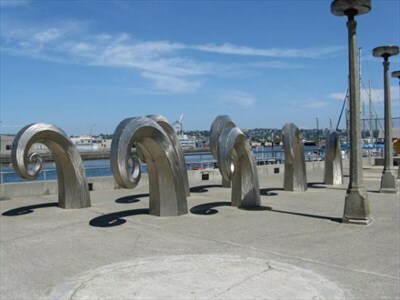 As I walk toward the locks, I pass by the Salmon Waves sculpture that graces the landing that sits over the salmon ladder viewing room. Most of the time there are kids climbing over the waves (my son has done so many times himself) and tolerant, patient parents waiting. Past the sculpture is a walkway crossing over the dam that makes up the South side of the locks. Through the dam several gigantic, tubular sluices spew green, frothy water from Lake Union to the lower level of the ship canal below. The smells of water and algae and a little bit of salt fill the air, and looking East and West it’s not uncommon to see salmon leaping from the water like leaves made of mercury, flickering in and out of the corner of your eye, leaving bubbles and expanding ripples behind. Walking past the dam, there are two locks, one smaller and one larger. On a recent September day I saw a huge ship, deck covered in cages, taking up most of the large lock, pointing out to sea. If I’m there when they’re actively transiting a ship, I might stay around for a few minutes to watch the simple, engineering magic of vessels moving up and down-stream through the basic principle of water seeking its own level. Tourists, often, are walking back and forth along the walkway, brought by buses from the Magnolia side. They peer over and down at the fish ladder, and discuss whether they’ll see a salmon jump to the next rung. They also amble around the locks, watching as the locks personnel chivy boats into organized lines, letting out or pulling in line as needed as the water in the Locks rises or drops. Past the locks, heading North, a couple of paths pass through beautifully tended grounds and gardens, past the Army Corps of Engineers’ museum, past fuchsias and other flowers and spreading trees and manicured lawns. At the far end a sign at the gate tells me I can once again mount my bike and ride, and I do, peddling up the hill to home. People might look at me and say, “well there’s a person that’s not affected by the shutdown.” It’s true that I work in the private drug development industry. The halts in NIH and NSF funding aren’t affecting my day-to-day work and research. I am, fortunately, luckily, insulated from the reduction in many of the other services provided by the government. But I am still affected. We’re all affected, in ways large and small. The Ballard Locks aren’t just about commerce and boats, about getting fishing and exploration vessels out into the ocean, about getting sunburned, happy boaters back in to their berth in Lake Union. They’re not just about salmon and education and finding the right compromise between nature and civilization that we’re always trying to reach. They are part of the community and our culture. When the gates shut, a small, vital part of Seattle, of this city of bridges and connections, was shut as well. I talk a lot about networks and systems on this blog. What seems to get lost in the rhetoric and finger pointing is that one of the major functions of government is to codify the simple fact that we are all networked together, all connected, all interdependent, and government’s role is to protect and strengthen those connections. Right now this simple, important, crucial function is blocked. And that’s a shame. This entry was posted in Civic Development, Networks and Systems and tagged Ballard Locks, community, connections, government shutdown, Hiram M. Chittenden Locks, Lake Union, Myrtle Edwards Park, Puget Sound, Salmon, seattle, value. Bookmark the permalink. Hi Kyle, Nice story. I think the locks connect ballard to magnolia, not to queen anne. Thanks for catching that. You’re right and I’ve corrected that.